A smaller tree/shrub that is versatile and can withstand cold weather climates. Deer resistant and has a moderately fast growth rate. Can identify from other alders or similar species as it has pores or speckles on its branches. This alder has nitrogen ﬁxing properties and is know to help poplars and ash species nearby to grow quickly. 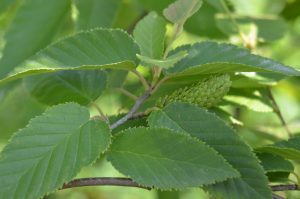 The alder itself is a fast growing species. Leaves : Leathery, medium green with wrinkled surfaces. Similar appearance to paper birch leaves.